It takes a lot of planning and hard work to create a piece of perfect beauty, and who knows this better than the enamellers, gem-setters, guillocheurs, engravers and other master craftsmen engaged in the watch industry? 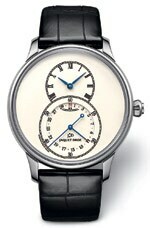 After all, they fulfill quite a quixotic function, turning devices meant to showcase time into classics of a timeless nature. In this section, we focus on elegant pieces that, upon being strapped on the owner's wrist, shine with a light of their own. Whether it's artist Willard Wigan's nano-sculpture for the Art Piece-1 by Greubel Forsey, Cartier's floral marquetry, or the Fabuleux Ornements collection by Vacheron Constantin, there is many an object of desire to be appreciated in the pages that follow. Go ahead, be dazzled. Featuring a 30-degree inclined double tourbillon and a nano-sculpture on the dial that can be fully appreciated only through a microscope, this watch is the perfect marriage between artistic brilliance and elegant technology. An expression of Vacheron Constantin's expertise in the field of design and decoration, this device demonstrates openworking in 18-carat gold, a mere 1.64mm, into four creations influenced by Ottoman architecture, Chinese embroidery, Indian manuscripts and French lacework. 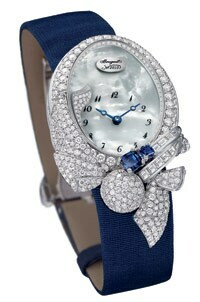 A timepiece, or is it a painting? 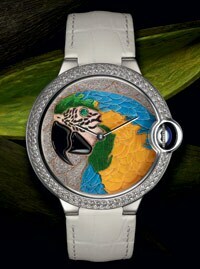 With exquisite craftsmanship, diamonds, an emerald, and actual flower petals etched onto the plumage of an artistically sketched macaw parrot, you will have a winner on your wrist with this unique piece of work. Harking back to the age of Queen Marie-Antoinette, this work of art combines brilliant cut diamonds with a mother-of-pearl dial and a gem-set bow that creates the feel of rustling frills. What's more, it comes with a jewellery set comprising a ring, a necklace and earrings. 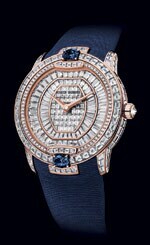 Drawing from nature and imagination, everything about this piece, right from its intricately sculpted mother-of-pearl dial to its exotic diamond artistry, evokes a world of harmony and beauty. 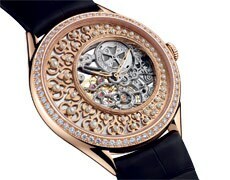 Eighteen-carat rose gold shell encrusted with 47 brilliant cut diamonds; mother-of-pearl dial set by diamond cluster motifs; water resistance up to three bars; looks that enthrall royalty. Finery doesn't get any finer. 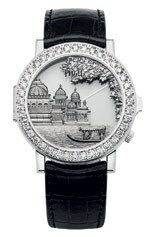 A part of the 'Mythical Journey' collection, the Lake Palace Watch version is an interpretation of the monument on Udaipur's Pichola lake, rendered using a combination of gold leaf and champleve enamel on the dial. International brilliance in India-inspired art. Like jewellery that's alive, this beauty from the Velvet Haute collection adorns your wrist with precious stones and sapphires while stridently ticking on at a frequency of 28,800 vibrations per hour. 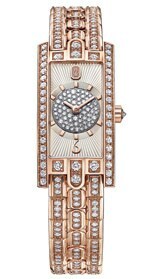 Tired of timepieces pockmarked with stones? This piece has a clean ivory enamel dial, the outcome of the historic Grand Feu processing technique, which ensures you don't lose yourself in the clutter. Simply elegant. 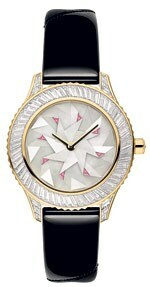 A bezel set with baguette helix-cut diamonds, horns with baguette-cut diamonds and a mother-of-pearl marquetry dial studded with triangular spinels, all brought together to resemble an exquisite piece of Japanese craftsmanship. What's more, it's a piece unique. 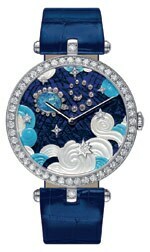 Fancy a piece of the starry sky for yourself? 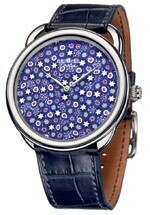 Combining watchmaking and crystal designs, the cheerful dial of the Arceau Millefiori is made of 'slices' of tiny baton-cut crystals. Beauty unleashed.